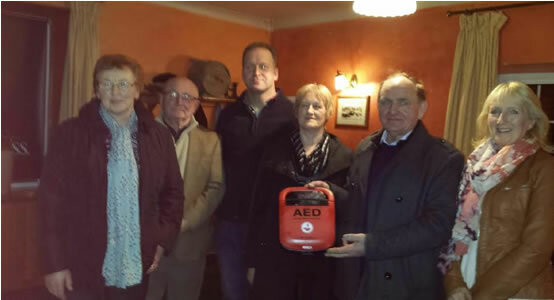 The official launch of the new defibrillator for Kilbarron occurred on Friday January 30th 2015 and saw the culmination of events organised by the Kilbarron 200 Celebration Committee. This very worthwhile piece of equipment for the Parish came about as a result of funds raised from the hugely successful James Kilbane concert held in the Church as part of the 200 year celebrations in June 2014. We would like to congratulate and thank those newly trained voluntary first responders who received their certificates from the Red Cross on the night. The new defibrillator is located on the outside of Hannigan’s shop, should it be required, and a full list of the trained personnel and their phone numbers will be made available throughout the Parish. The Committee would like to thank those who subscribed and everyone involved who made this possible. 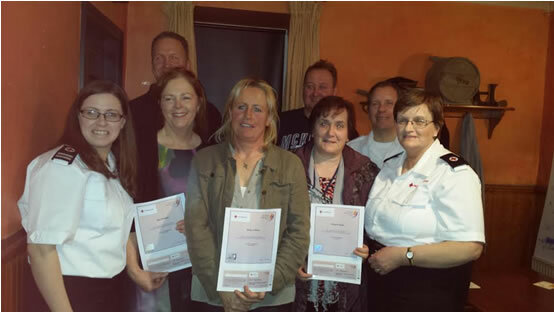 Recently trained volunteers who received their Emergency First Responder certificates – James Mulvihill, Michael O’Meara, Jane Hannigan, Tess O’Meara, Margaret Dunne. Pictured also is Irish Red Cross trainer Caroline Prout, who was assisted by members Peter Armstrong and Mary Prout. Kilbarron Church 200 committee members with the new defibrillator which has been installed in Kilbarron village. – Breda Cormican, Frank Moran, James Mulvihill, Ann Butler, Christy Cormican and Bridie Brophy.